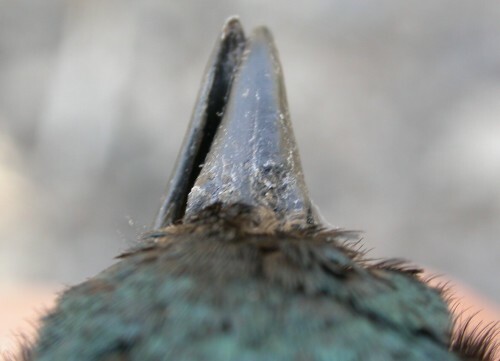 Banding offers us a rare opportunity to take a close look at some of the oddities of the bird world. 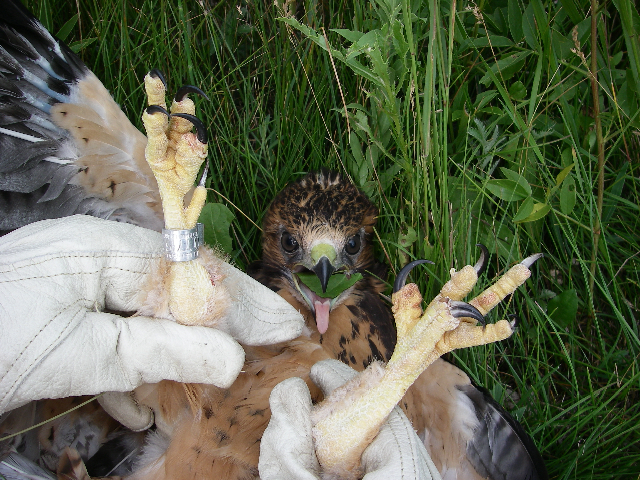 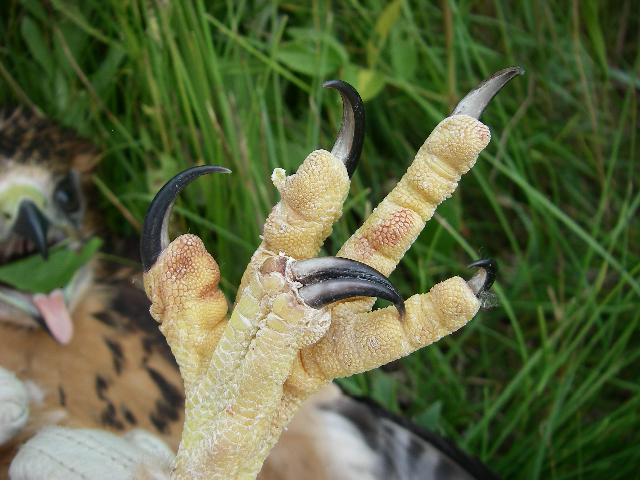 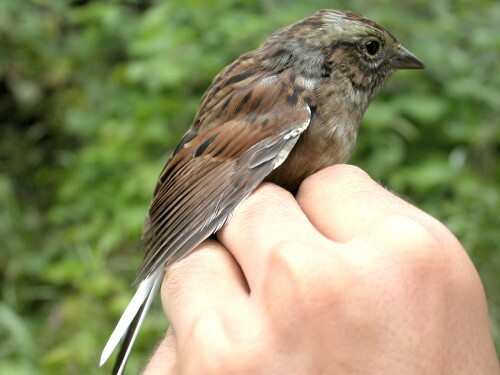 Abnormal pigmentation, deformities, irregular moulting, and even hybrids are under normal circumstances difficult to spot and describe, but having birds in the hand allows us to document their occurrence and investigate the causes behind them. 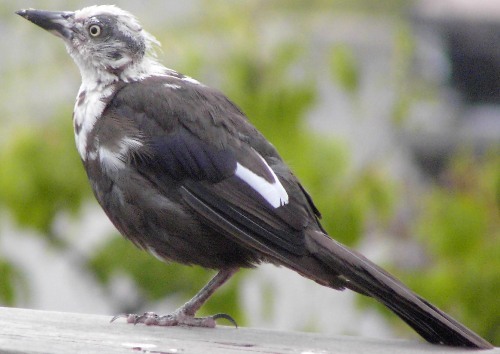 On this page we feature photos of some of these 'odd birds', along with commentary on some. 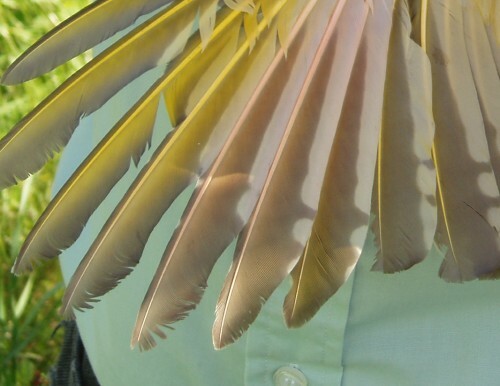 We welcome your input - please e-mail us (oddities@migrationresearch.org) if you have similar experiences or any comments to share. 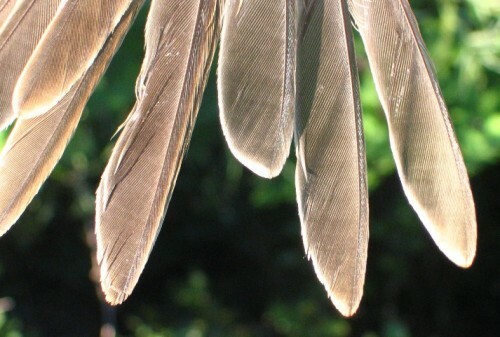 Photo by Marcel Gahbauer, October 2010 - click here for additional photos. 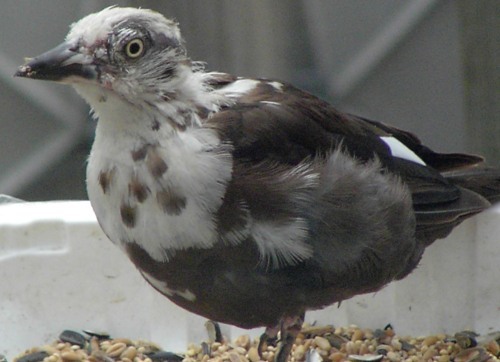 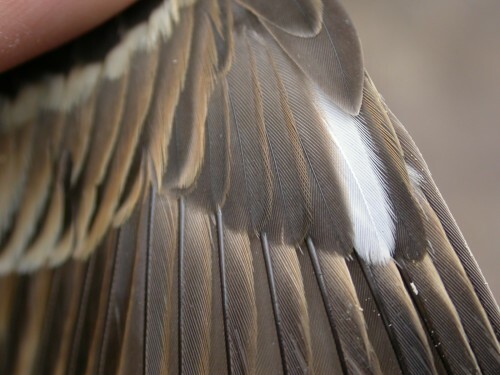 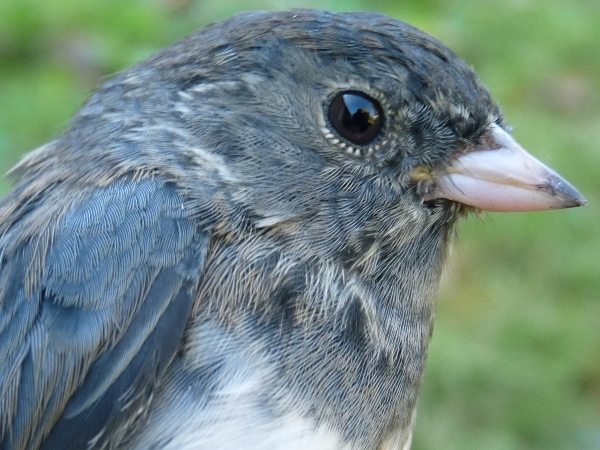 Aside from the obvious patches of white feathers, there is a second oddity of note with this bird, namely the very small minority of brownish juvenile feathers that appear to have been replaced with blackish adult feathers. 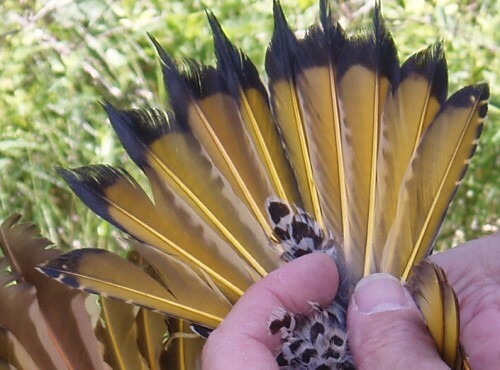 Where the ranges of Yellow-shafted and Red-shafted Flicker overlap in western Norther America, intergrades occur that have uniformly orange feather shafts. 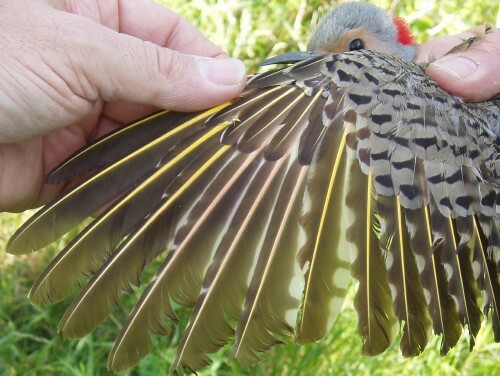 The bird in the photos below is a Yellow-shafted Flicker, but with unusually pink-shafted feathers on both wings and the tail. 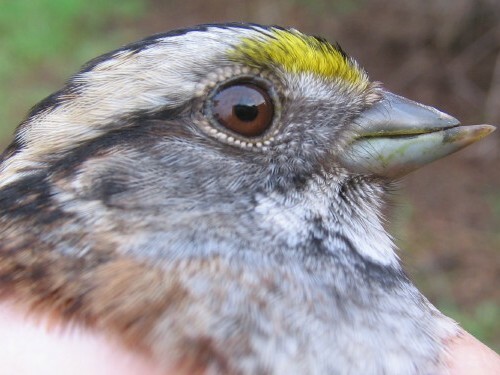 Note the three distinctly pink-shafted primaries in the first two photos below, contrasting with the remainder of the yellow-shafted flight feathers; this pattern was symmetrical. 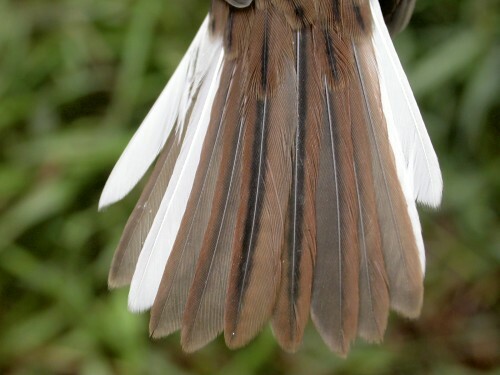 The third photo shows the tail, with the shaft of r2 on both sides slightly more pink than the adjacent feathers (the contrast doesn't show up on camera as well as it did in the field - and is clearly less obvious than that of the wing, visible in the background of the same photo). 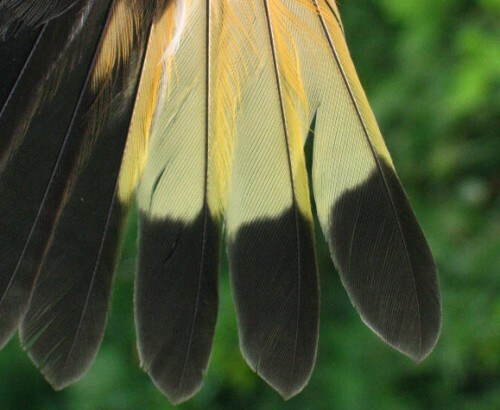 This atypical colouration may be related to diet at the time these feathers were being moulted - any further thoughts on this or examples of similar patterns in flickers are welcome (oddities@migrationresearch.org). 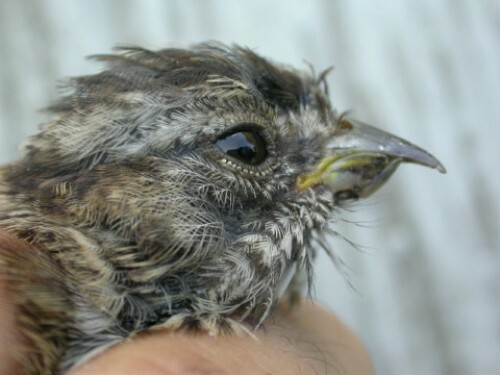 This Song Sparrow was banded earlier in August and was distinctly in juvenile plumage at the time. 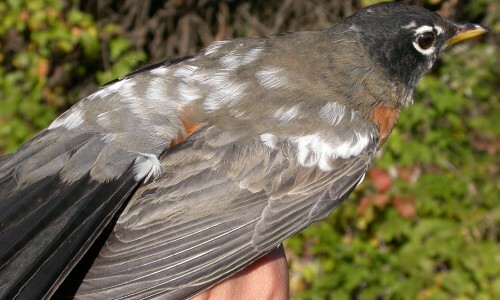 Upon recapture on August 25, it was seen to be replacing its primary coverts sequentially, along with the corresponding primaries. 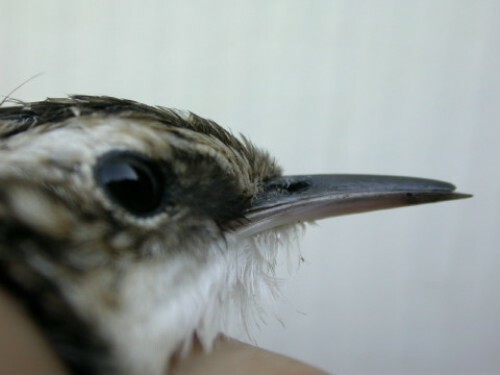 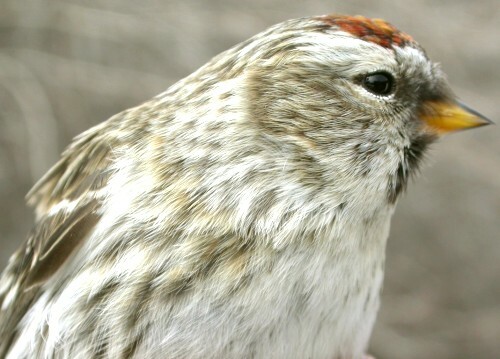 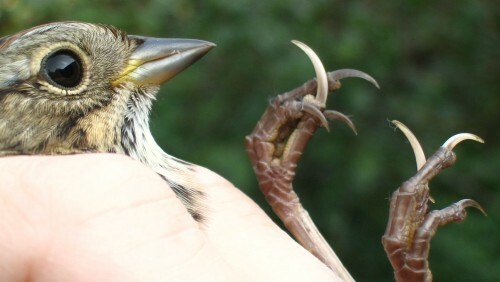 Such a pattern of feather replacement was believed to occur only during second and subsequent prebasic moults, but as this bird has shown, there is still a lot to be learned about even the most common species. 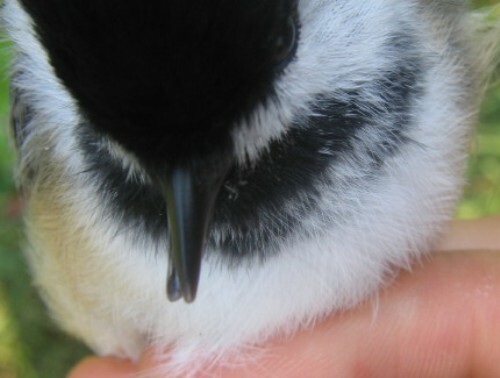 This peculiar-looking chickadee appears to be a resident at the Inglewood Bird Sanctuary in Calgary, first caught during banding activities in July 2007, and recaptured at least twice more in August and September. 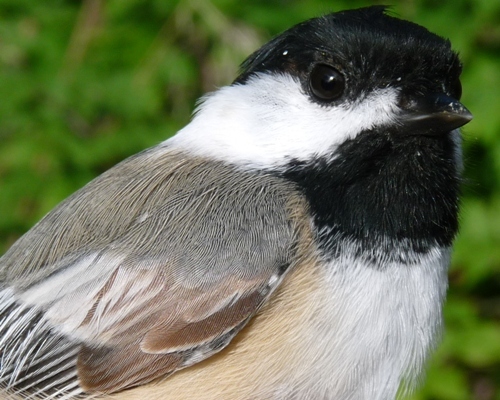 It was speculated to be a hybrid between a Black-capped Chickadee and either Boreal or Chestnut-backed Chickadee. 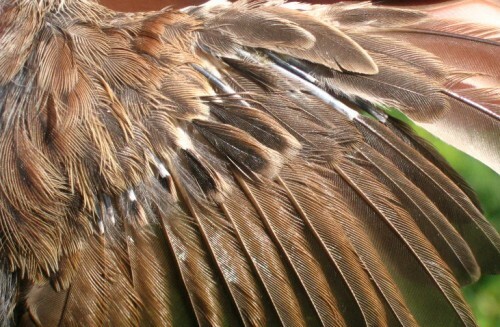 However, the patchy appearance of brown feathers suggests they may just be a plumage abnormality. 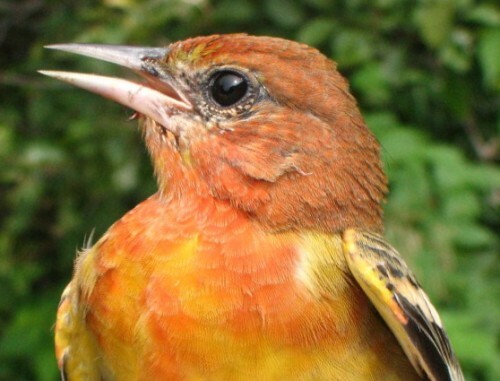 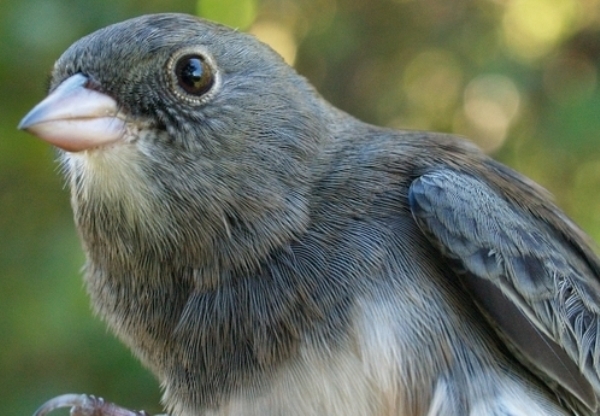 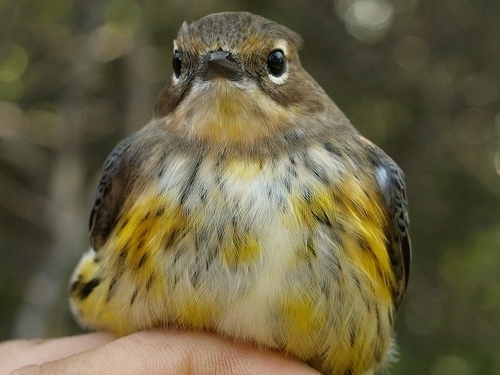 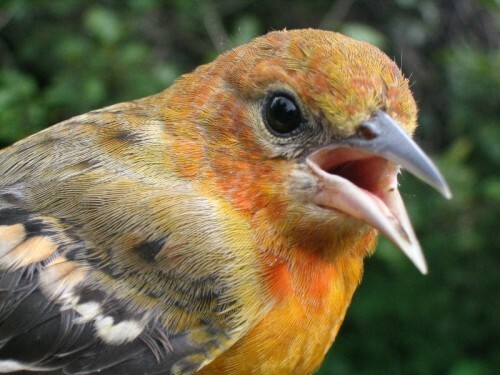 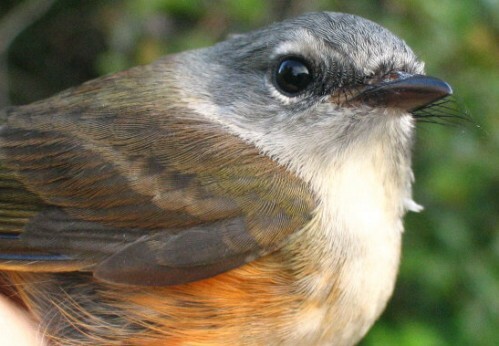 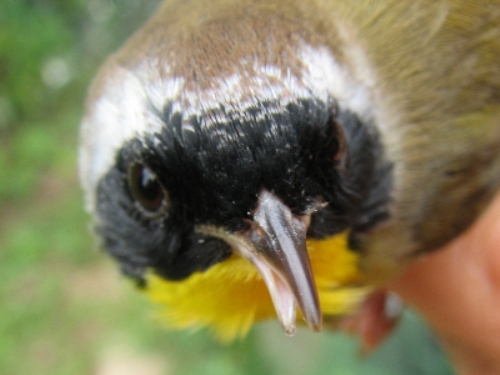 Any thoughts about the identity of this bird are welcome (oddities@migrationresearch.org).